(mens M) Ugly Xmas Pullover Sweater, Green with Big Santa Next to Gaudy Xmas Tree! Very Fancy. Home > Ugly Christmas Sweaters > mens MED Ugly Christmas Sweaters > (mens M) Ugly Xmas Pullover Sweater, Green with Big Santa Next to Gaudy Xmas Tree! Very Fancy. 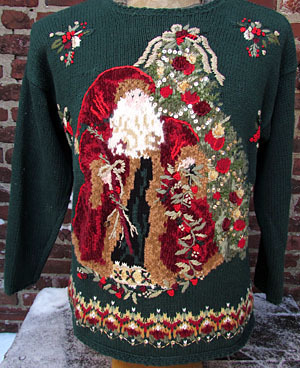 Vintage Ugly Christmas Pullover Sweater! Dark Green knit with a majestic Father-Christmas-looking Santa in a wine colored robe (With a JINGLING Bell!) standing next to a decked out Xmas tree with Gold sequins, glittery Gold thread and red berries. Clusters of holly on each side and an ornate border of Red, Green, and Yellow with Beads runs across the bottom. Back and sleeves are solid. Ornate finish on the collar, cuffs and hem. Tagged by Tiara Petites. Ramie/Cotton.